Although it's been said breakfast is the most important meal of the day, there may be a new contender rising. Recent studies are showing that employees who take a designated lunch break are more likely to be productive in the afternoon and avoid long-term burnout. Breakfast has clearly been shoved out of its once-coveted role of "most important meal," and the reign of lunch has begun. Lunch's sudden rise to popularity hasn't come without one or two negative side effects. The most worrying of these is how often Americans are dining out for lunch per week and how much they're spending when they do. If you're looking for an alternative to eating gourmet sushi five times a week, the best option is one that's been with us since we were children: the brown bag lunch. When you're actually paying for one lunch, it might not seem that expensive. Eating four lunches out a week at $10 each has to be cheaper than throwing away $50 on groceries at the start of the week, right? Actually, studies have shown that eating out for lunch can drain anywhere between $1,500 and $2,500 per year from your budget, depending on where and how often you go out to eat. That might seem like an outrageous amount, but the math is pretty clear. Eating out four times a week, with each meal costing about $12, for forty-eight working weeks in the year gives us a total of $2,304. However, with the right strategies in place, the amount you spend on groceries can come down a lot or stretch each dollar further. With some planning, you can spend as little as $5 per brown-bag lunch. Five meals a week, times $5 per meal, times 48 working weeks equals only $1,200. 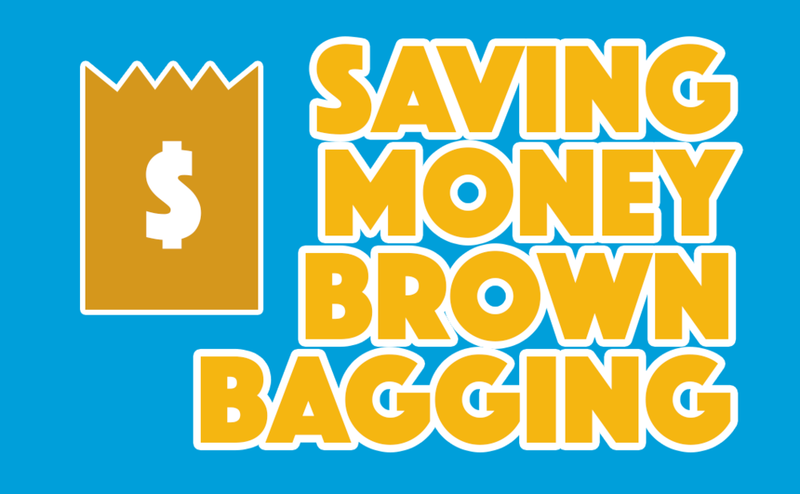 Brown bagging adds a $1,104 to your year. Interested? Here are three tips to help jumpstart your new lunch habit! There are a few odd ways to trick yourself into saving money at the grocery store. First, bring your headphones! If you listen to upbeat music while you shop, you'll shop quicker and be less likely to linger in aisles, so you'll end up buying less of what you don't need. One study even found that this method reduced purchases by 29%. Second, don't forget to do a pre-checkout lane audit of your cart. Grocery stores have designed their check-out lanes to discourage people from returning items to the shelves. Don't be afraid to pass off any items you realize you don't need to an employee nearby, rather than buying them just to avoid awkwardness. In the land of lunch, the sandwich still rules. It's hard to beat the versatility of delicious fillings between two slices of bread. One thing that can be beat, though, is pre-sliced deli meats. Beyond being packed with unhealthy preservatives, these can get pretty expensive, especially if you opt for higher quality and/or brand names. There are a few alternatives. First, you can order large cuts from the butcher counter and slice them up yourself. With a little bit of practice, you can get sandwich-sized cuts of ham, turkey, or chicken for a fraction of the cost. Plus, you'll have leftover bits to use for soups and other easy dinners! Second, you can go beyond the slice. Pretty much any protein cooked in barbecue sauce is going to taste delicious, and it's very easy to do. A slow cooker can take most of the work out of the process. Just drop your cuts of meat in the pot, cover them in sauce and cook them on low for a few hours. You can shred them with a fork for delicious barbecue sandwiches all week long. After you've done your grocery shopping with all your newfound shopping wisdom, the only thing left is to make and eat your brown bag lunch. As with any major life change, it's going to take a little practice. After your first few bagged lunches, you may begin to miss your old going-out-to-eat lifestyle, but stay with it. Luckily, there are some strategies to help with that, too. One is to pack ahead of time. If you have to add "make lunch" to your already rushed morning routine, it'll be tempting to just not do it. Instead, prepare the pieces for all your lunches at the beginning of the week and store them in the refrigerator so you can grab them and go at a moment's notice. Also, be prepared to turn down co-workers who invite you to eat out with them. It's better to think of a response in advance so you won't be caught on the spot trying to think of an excuse. Finally, don't feel like a brown bag lunch means you have to eat at your desk. Weather permitting, you can take your lunch to a park or other outside area and have an impromptu picnic, or you can sit in your car and listen to the radio. Making sure you still have a "break" with your lunch will make the transition to bagged lunches easier. Changing your eating habits to save money can seem too easy, but saving $1,200 a year is nothing to scoff at, especially for something so easy to do. If you can put the energy into leaving work, paying for a meal and driving back, you can find it in yourself to go shopping once a week and pack your own lunches. YOUR TURN: What are your favorite lunchtime hacks? Do you have a process or ritual that gives you the energy you need to power through the afternoon? Use the comments to share your favorite mid-day meal solutions!